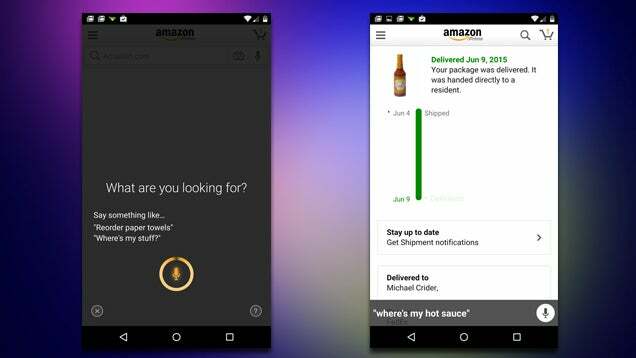 Amazon for Android Now Supports Voice Commands Like "Where's My Stuff"
Voice commands are great. While we’re used to using these in our various personal assistant apps, Amazon is getting in on the action with app-specific voice commands in its app, including things like “where’s my stuff?” and reordering some items. The feature was quietly added a couple weeks ago, though the company has only recently updated its changelog. You can now use voice commands to ask about existing orders with commands like “Where’s my stuff?” or more specific questions like “Where’s my blu-ray?” You can also use voice commands to re-order items like paper towels and other sundries. It’s not a revolutionary breakthrough, but clearly Amazon is putting what it’s learned from the Amazon Echo to good use.